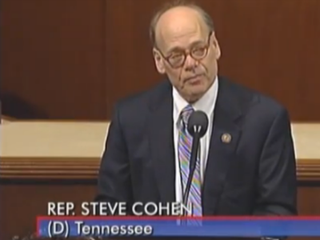 In comments on the floor of the House of Representatives Monday, Tennessee Rep. Steve Cohen linked the story that inspired Red Tails to the ongoing battle against racial prejudice in the United States. Cohen, who also spoke at the funeral of Tuskegee Airman L. Col. Luke Weathers on Friday, said the film is "part of black history, but beyond black history, it's America's history … it's a story about fulfilling America's promise." But his emotional remarks weren't all warm and fuzzy. "There are still barriers to be broken," he said, adding pointed remarks accusing people who resist President Obama because of his race and call him a "food stamp president" of being "backwards-thinking, just like people were in the 1940s." His advice: "See the movie, remember the Tuskegee Airmen, realize how far our country has come and get beyond any bigotry that we have in ourselves. "